That old Duke of Windsor just had some kind of influence on men’s fashions, didn’t he? He springs to mind today as it is incredibly cold (for Virginia — Call Me Al, hope you enjoyed sunrise over the swamp and at least saw a few flying today….) with temperatures expected to top out around 27ºF. In the days before central heating, say 1921, this kind of weather would send you scurrying for the sweater drawer to add another layer to your suit. And if you were Edward VIII, Captains of the Royal and Ancient Golf Club at St. Andrews, you might reach for a classic Fair Isle sweater to keep you warm on a very cold course. When Edward wore his for his portrait, the Fair Islanders had been knitting sweaters for only 50 years or so. (Hats, scarves and gloves were the norm of the previous hundreds of years.) The sweaters became such a hit among those who sought to emulate the stylish dress of Edward, that they quickly became an unofficial part of the school uniform among the Oxbridge crowd. The sweater continues to be hand knit in Fair Isle, which is a remote island off the northern coast of Scotland, between Shetland Isle and The Orkneys. They are colourful numbers, as you can see in the picture above and I can attest to their extreme warmth. The colourful horizontal bands of pattern are sure to enliven even the greyest winter’s day. An authentic Fair Isle sweater cannot be purchased outside the UK. Fortunately, we have the internet. Mrs. E. and I got ours here, and these folks pop up on the internet search, too. The first I ordered turned out to be too big to wear under a tweed jacket, so I ordered a smaller size — after much convincing of the very kind proprietess — and got it just about right. With the temperature now standing at 17ºF, I only wish that I had had the Prince of Wales’ foresight and ordered the long sleeve version, too. Since each sweater requires about a hundred hours of handwork, it might take a while to get yours. It will be worth the wait. And like all articles of clothing that I recommend, it will never really go out of style. Out of fashion, certainly, but not out of style. That makes it an easy and elegant addition to your winter wardrobe. 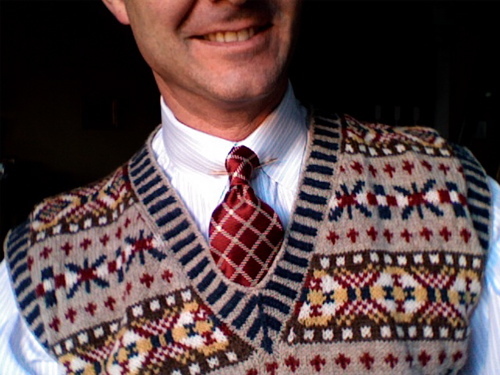 This entry was posted in Elegantology and tagged Edward VIII, fair isle sweater, Prince of Wales, St Andrews. Bookmark the permalink. I like the tie in the picture. Can we get some more info on this? Hello sftrny, thank you. It is an ancient (read 1990) Ralph Lauren/Polo. Good design and a moderate width will never date. I dread the day it wears out. I have always adored Fair(Ilse) sweaters and the lore. Perhaps from my designing days at Ralph Lauren and all the photos that I have saved of the pretty yarns, the heather and the incredible patterns involved. Imagine hand knitting one! I am a bit of a knitter, and I have not had the nerve or skill to attempt one of these. I have made a couple of the icelandic ones though. I seem to recall reading that the Fair Isle patterns were developed to help identify the local fishermen, especialy in the grisly task of IDing those drowned. But now after a quick search I find nothing; anyone else heard this one? Mr. E thanks for the mention. Keeping in mind your instructor’s observation, “there’s no bad weather, only bad gear,” I was well prepared for the frozen gorgeous dawn. CallMeAl, that was the rumour about fisherman’s cableknit sweaters. In actuality, they are based on ancient Celtic designs. Mrs. PvE, I could not begin to imagine the skill involved. This looks great on you! I’m a big of fan of Fair Isle sweaters. They are so beautifully knitted and it’s a lost art. People don’t make those anymore. I went to university at St. Andrews and during my student days, Fair Isle sweaters and denim jeans are what you might call “campus wear”. It’s still popular with golfers who come to play golf in St. Andrews. I think this is the only time when men can get away by wearing bright sweaters and bright colour trousers. Of course, in the 80s, Fair Isle sweaters become a signature of upper classes or sloane rangers (such as Lady Diana Spencer who wore fair isle baggy jumpers and collar up shirts) who live in big, freezing cold castles. My older brother is in his 70’s and not well, but one of his wishes ( bucket list) is to own a Vest sweater knit of Wool( woven fabril) like Edward Prince of Wales . And I been searching and is until now that I come across this site. The way he has discribe it to me is with a “Geometric Patterns” with yellow , read colors, also with the opening in the front with Bottoms and very important that it has 2 pockets one on each side of the opening. Can you help on providing me with the resources to be able to achieve this Very important information? Please????? I wouldn’t ask if I didn’t feel was very important! I will always be grateful and my deepes Thank You!